A new National Academies study warns the U.S. has lost leadership in high-intensity ultrafast laser research to Europe. To regain ground, it recommends the Department of Energy invest in at least one new large-scale facility and lead the development of a coordinated national research strategy. A physicist sets up a target for a petawatt laser experiment at the Jupiter Laser Facility at Lawrence Livermore National Laboratory. 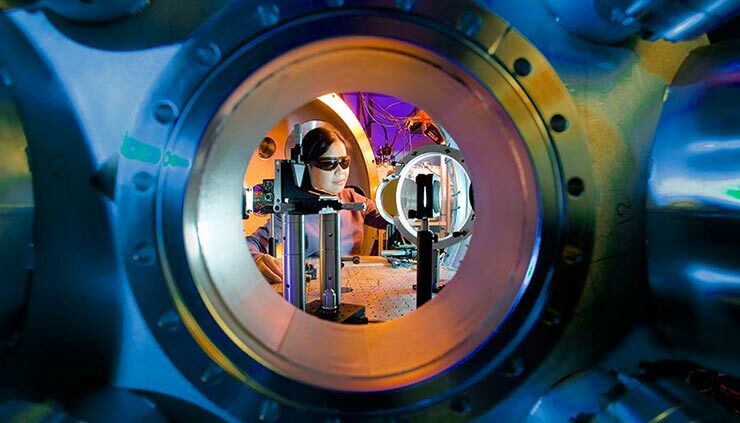 On Dec. 6, the National Academies of Sciences, Engineering, and Medicine released a report on the state of U.S. high-intensity ultrafast laser research. It is the product of two years of work by a study committee chaired by physicist Phil Bucksbaum, director of the PULSE Institute at Stanford University. The committee finds the nation’s position in the field is swiftly eroding as European researchers make large, well-coordinated investments. To reverse that trend, it recommends the Department of Energy take the lead in crafting a national strategy, including construction of one or more large-scale facilities. While the study discusses U.S. laser research and technology generally, its focus is on lasers near or above the petawatt (1015 watts) range, the highest-power lasers currently in operation. Because the energy these lasers transmit per unit time is extraordinarily large, their pulses must be extremely short, lasting only femtoseconds (10-15 seconds) or even attoseconds (10-18 seconds). In articulating the value of a strong U.S. position in petawatt laser R&D, the committee emphasizes the technology’s scientific uses. It explains that the energy such lasers confer to electrons in high-density matter is allowing researchers to open new regimes of plasma behavior for study. Moreover, it notes, some of this behavior replicates physical processes present in the early universe and in certain stellar phenomena, making the research valuable for astrophysicists. The committee also emphasizes that these plasma studies have well-established applications in DOE's nuclear stockpile stewardship program. Finally, the committee anticipates that future high-intensity lasers may be uniquely capable of probing certain fundamental physical processes. Lasers that reach the theoretical Schwinger intensity (2x1029 watts per square centimeter) could “boil” matter-antimatter particle pairs out of the quantum vacuum. Ultrafast lasers can also be used to investigate small-timescale events such as electron motion within molecules, and could ultimately do so on zeptosecond (10-21 second) scales. While the committee acknowledges that the “main application” of high-intensity lasers is to science, it does dedicate a chapter to various potential commercial and medical applications. Many of these, such as precision machining, would augment existing laser applications. According to the report, high-intensity lasers could also enable new “tabletop” X-ray lasers, which might develop a commercial market exceeding $100 billion. High-power laser facilities that are operational, under construction, or proposed. Figures represent the sum of the peak power of petawatt-class lasers on each continent. The committee is highly critical of the U.S. failure to set the pace in petawatt laser research following a long period of leadership that lasted through the 1990s. The committee observes that, over the last two decades, the growth of laser research in Europe and Asia has been “stunning, coordinated, and rapid.” The Europeans, it argues, have been particularly effective in developing a well-integrated research and engineering community around petawatt lasers. The committee credits Laserlab-Europe, a confederation of 33 research organizations across 16 countries, with having “had a great influence on science policy,” leading to the establishment of the Extreme Light Infrastructure (ELI) project in 2009. ELI is currently building a series of petawatt lasers at facilities in Eastern Europe, with the goal of driving toward an exawatt (1018 watts) laser, which could achieve intensities of up to 1025 watts per square centimeter. The committee notes ELI has been able to harness a 10-year commitment of $1 billion through the EU’s Horizon 2020 research funding program and the contributions of individual EU member states. The committee suggests that U.S. research has, by comparison, lacked an “effective strategy.” DOE, it notes, “has been an effective steward for large-scale laser facilities for specific research programs, such as [Lawrence Livermore National Laboratory’s] National Ignition Facility (NIF), which mostly served the DOE weapons program.” Agencies have also funded individual investigators. According to the committee, the current situation is the result of large projects, particularly NIF, squeezing DOE funding for other projects. It explains, “Smaller, more creative and exploratory efforts in laser science became victim of the expanding needs of large-scale laser projects, leaving very little ‘free energy’ for creative ideas in advanced high energy laser science.” While various agencies continue to pursue high-intensity laser projects, those projects have generally served mission-oriented research goals, and support and collaboration have, in many cases, been ephemeral. The committee thus finds there is “no cross-agency stewardship” for high-intensity laser research, which has fragmented the community and diminished academic work and collaboration with industry. It calls the lack of stewardship “particularly dire” with respect to the commercial sector, in view of a “steady stream” of high-intensity laser startups now emerging in Europe. The committee suggests that European success stems from decision makers there essentially following recommendations made by reports produced in the U.S. These include the National Academies’ 1998 report, Harnessing Light: Optical Science and Engineering for the 21st Century, as well as the 2002 workshop report, Science and Applications of Ultrafast, Ultraintense Lasers (which Bucksbaum helped organize). As a result, the committee argues, while U.S. work in petawatt lasers was still surging about 10 years ago, the momentum is now entirely in Europe, with no new U.S. facilities due to come online in the near future. 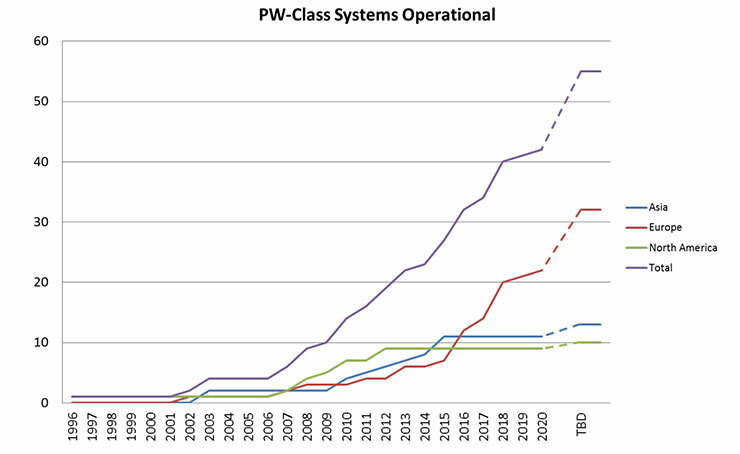 The total number of operational petawatt-class laser systems in Asia, Europe, and North America over time. The committee specifically recommends that DOE should plan “at least one large-scale open-access high-intensity laser facility that leverages other major science infrastructure in the Department of Energy complex.” It notes that co-location with infrastructure such as particle accelerators would provide the U.S. with a “key advantage” over the European ELI initiative. The Optical Society (an AIP Member Society) and the American Society of Mechanical Engineers will be hosting a Capitol Hill briefing on the report on Dec. 12. The National Academies and the National Photonics Initiative will be hosting a separate briefing on Dec. 14. The study was sponsored by the DOE Office of Science, the Office of Naval Research, and the Air Force Office of Scientific Research.